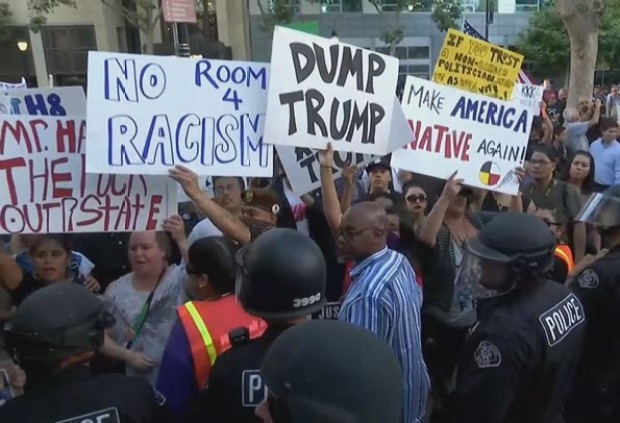 Donald Trump supporters leaving the presumptive GOP nominee's rally in San Jose on Thursday were pounced by protesters, some of whom threw punches and eggs. 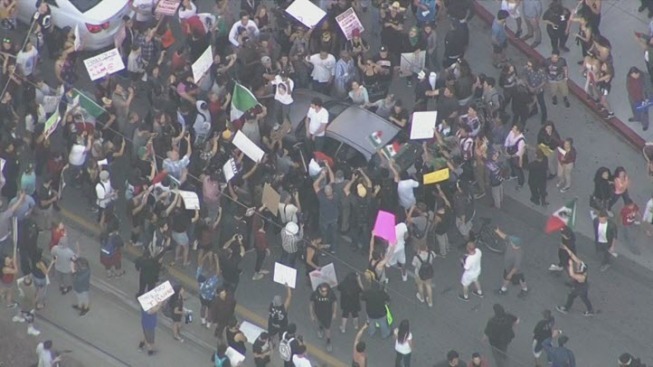 The protesters chased and taunted Trump's supporters outside the San Jose Convention Center. They surrounded one woman and threw eggs and bottles at her. "It was unbelievable," said Steve Tong, a Cupertino resident who attended the Trump rally. Tong said after the rally, he was walking toward a nearby parking structure and saw protesters surrounding and taunting an elderly couple. "I've never seen anything like that in America before," Tong said. Tong also said he saw protesters smash car windows inside the parking structure. The San Jose Police Department said there were a few arrests made, but it did not provide specific numbers or information on those arrests. There was no significant property damage reported. One officer was assaulted, police said. "Our police officers have done an extremely courageous and professional job so far," San Jose Mayor Sam Liccardo told The Associated Press by phone. "We're all still holding our breath to see the outcome of this dangerous and explosive situation." "At some point Donald Trump needs to take responsibility for the irresponsible behavior of his campaign," Liccardo said. Such protests are unlikely to be repeated on Friday when Trump holds a rally at the airport in the much smaller and more conservative city of Redding about 150 miles north of Sacramento. Adam Rivas, a 22-year-old community college student who was born and raised in San Jose, was holding a spray-painted sign that read "Dump Trump" on Thursday. 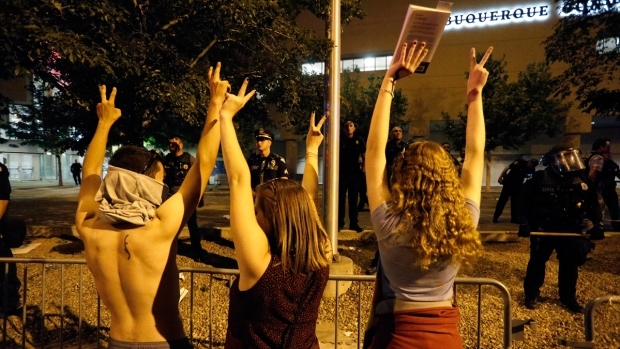 Protests outside a Donald Trump campaign rally in Albuquerque, New Mexico, turned violent on Tuesday night. Demonstrators threw burning T-shirts and other objects at police as their focus shifted from Trump to the Albuquerque Police Department. 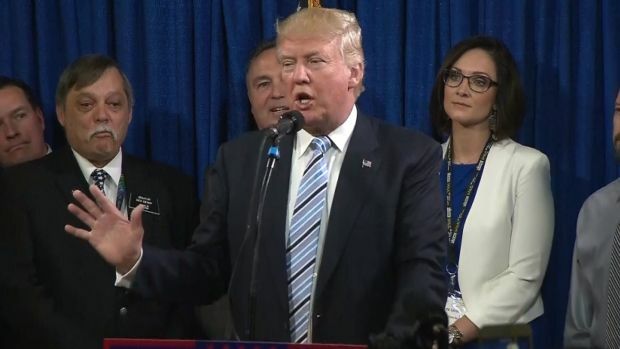 Rivas said he was particularly disturbed by Trump's remarks about Mexicans. "For any one Mexican here he bashes, there are about 20 Mexicans out there who are hardworking and just doing their job,'' he said. Trump's appearance in Sacramento Wednesday night drew a very small group of protesters that was dwarfed by thousands of supporters. 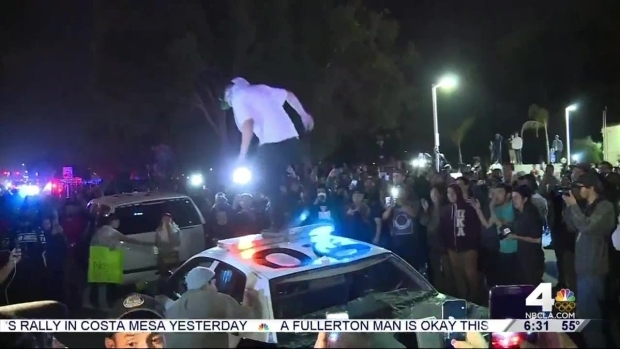 But California campaign rallies last week saw some clashes between protesters, supporters and police that led to several arrests. During the rally at South Hall, an annex of the San Jose Convention Center, Trump addressed about 5,000 supporters in attendance. 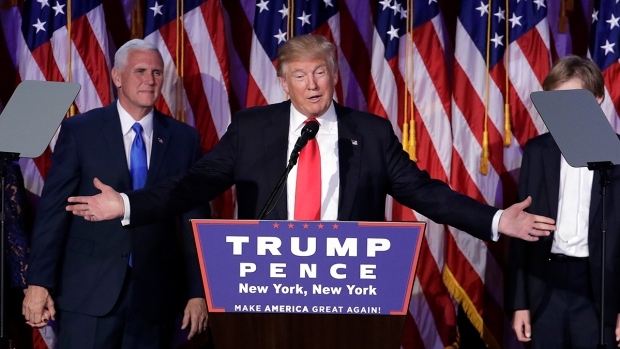 Trump discussed Democratic presidential candidates Hillary Clinton and Bernie Sanders. He called Clinton "pathetic" and accused Sanders of "rigging the system." The Republican presidential candidate also continued his stance on toughening immigration laws. "We're going to bring people into this county, but we're going to bring them in legally," Trump said. Seventeen people were arrested in a protest outside a rally for Republican presidential front-runner Donald Trump in Costa Mesa. 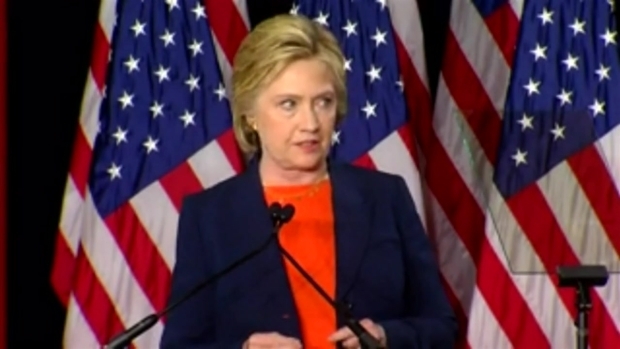 Toni Guinyard reports for Today in LA on Friday April 29, 2016. Thursday was Trump's latest Bay Area stop to woo voters with his trademark "Make America Great Again" rally. Thursday's rally is slightly over a month since Trump was forced to skirt a highway wall on U.S. 101 and hop down onto a grassy embankment to avoid an angry mob who was protesting his appearance at the California GOP convention in Burlingame. Due to security concerns, a handful of roads surrounding the convention center have been closed down, which already created a midday backup in downtown San Jose. His appearance, like the last time around on April 29, prompted a heavy police presence, and sources say the San Jose Police Department asked officers to volunteer to work overtime for Thursday's rally. Donald Trump has secured the number of delegates required to clinch the GOP nomination. In fact, Trump's speech was held at the same time as Game 1 of the NBA Finals where the Golden State Warriors played the Cleveland Cavaliers at Oracle Arena in Oakland. Trump joked at the rally that he wanted to attend the game.